Following a press and TV investigation in to the "Porkylights" low fat product (see our previous review) that when independently tested was questioned whether it was actually as low fat as the producer claimed, and about which Slimming World initially said was only 0.5 "syn points", then they changed their minds on such, you can understand our scepticism. Jason at Churchgate was completely honest with us on the makings for the Light Porks, such that in his opinion to create a low fat sausage is indeed difficult without effecting the "mouth-feel" of the cooked product when compared to a regular sausage. In reducing the fat content there also needs to be a slight reduction in meat content, and thus this may lead to the use of "fillers" which Jason would rather not use in his premium grade sausage whether they are low fat or otherwise. Now the fat content of the Light Porks from Churchgate is genuinely less than 3.7% and although the meat content is reduced from what we see normally to approximately 72%, this is still blooming good for a decent sausage in anybodies book. Cooked up the samples performed just like regular porks to be honest. We know Jason always uses decent natural skins and with the quality pork used he consistently produces good sausage. These Light Porks kept their plumpness and showed very little shrinkage and only moderate weight loss. Taste-wise very good, however we agreed that you could tell the difference between these and the regular Churchgate porks by the texture. There was a slight softer more open texture in our opinion, along with an only just noticeable "drier" mouth-feel. Although I did like them, some of the troops really did prefer the Classic Pork to these, so there you go, a well made sausage, but perhaps not something we would buy in preference. 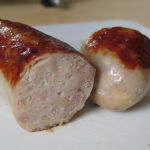 If you would prefer a "proper" lower fat sausage, we'd recommend that you buy some Churchgate LIGHT PORKs and try them yourself...and please tell Jason and Dan we said so! 115x32mm before cooking, 110x32mm after. 87g before cooking, 80g after. That's a shrinkage of 4% & weight loss of approx 8%.